The arrival of many hundred thousand people fleeing the Syrian civil war raises existential questions in all European countries. Political leaders across the continent respond to the perceived concerns of their citizens by painting challenges of integration as a reason to slow down or stop the influx. The European view of the crisis can benefit from lessons learnt elsewhere in the world, such as Uganda. As I follow the news of welcome, protest and anxiety in my home country of Germany from Uganda, I see a different picture in the country around me. Here, the overall number of refugees stands at 482,569, meaning a national ratio of one refugee to 77 nationals. What is only a scenario in Germany is a reality here. In local refugee hot spots, the numbers are even more impressive. The north-western district of Adjumani received, on average, more than 100 people fleeing the civil war in South Sudan every day for almost two years. Adjumani is now home to over 100,000 refugees living alongside just over 230,000 Ugandans, a ratio of 1:3. Despite their large numbers, there is no anti-refugee sentiment in Uganda to speak of, neither in the media, nor in the communities hosting the new arrivals. On the contrary, the local administration of Adjumani welcomes refugees and the lower levels of local government actively vie to settle them. The difference in mentality has an economic foundation, linked to Uganda’s refugee policy, which is one of the most progressive in the developing world. The Refugee Act of 2006 formalised a long-standing practice to grant refugees the right to work and freedom of movement within the country upon attaining asylum, along with access to basic social services. Refugees are allocated a plot of land for agricultural use and international agencies provide the resources to start out. Support is jointly coordinated by the national government and aid organisations to meet the most pressing needs, but also prepare for longer-term self-sufficiency. The impact of refugees and their supporting agencies on the local economy is hard to quantify. But the intensified agricultural productivity, increased demand for locally traded commodities and the impact of trading connections outside the country is distinctly felt when visiting the refugee hosting districts. Notably, the Ugandan practice also includes that all international refugee assistance programmes allow for a third of participants to be Ugandan nationals. Thus, both locals and refugees reap economic benefits and the relative equality makes possible a socio-cultural exchange that does not exist in situations where refugees are confined to camps. The Ugandan policy is in line with the UNHCR’s 2003 Durable Solutions framework, which lays out the way forward in situations of protracted displacement (i.e., countries hosting a large number of refugees which cannot return to their home over the span of several years). While ultimate solutions depend on political factors – eventual repatriation after the crisis in the sending country has ended, permanent integration and naturalisation in the hosting country, resettlement to a safe third country – economic steps can prepare the ground. The Durable Solutions framework proposes Development Assistance for Refugees as a foundation, essentially a collaboration of humanitarian and development actors to improve infrastructure and living conditions in refugee hosting areas. Building on this, the Framework envisions Development through Local Integration (DLI) following the goal of “creating an improved and conducive situation for refugees to become productive members of their host communities as well as improvements in the quality of life of host communities and refugees.” Central to this approach is to prevent or resolve the isolation of refugees in camps located in remote areas, which can lead to their negative perception as a “burden” on the receiving society. Local economic integration enables refugees to interact with the host population on more equal footing. Legal preconditions to this are the right to work, freedom of movement, and access to education and other services – essentially bringing the refugee status closer to the entitlements of nationals. Initially, economic assistance is required to enable people to become self-reliant. UNHCR’s Durable Solutions address refugee policies in poor countries like Uganda, but the goal of an improved quality of life for both refugees and host communities through local integration should also be adopted by industrialised societies faced with large influxes. In Germany, the government has implemented changes to the asylum law aiming to ease the economic integration of accepted refugees by shortening their waiting period for the right to work. States in the federal system (Bundesländer) also receive a monthly payment of 670 euros from the central government for each refugee they host. However, at the same time, the law drastically curbs access to services for rejected asylum seekers and enables their accelerated deportation; the list of “safe” countries of origin is extended to include Albania, Kosovo and Montenegro. In the same vein, Merkel is pushing for a European framework which will register all migrants immediately after entering the Union in order to send those without a claim to political asylum back to their country of origin as quickly as possible. According to plans, registration and sorting will take place in so-called “hot spots,” meaning camps in the Balkan frontier countries. The problem in Germany is narrowness in thinking about refugees. At the onset of the current influx, the head of the Federal Office for Migration and Refugees, Manfred Schmidt, resigned and stated his incapacity to deal with the wave of asylum applications. In a swift move, the minister of the interior appointed as Schmidt’s successor, the director of the Federal Employment Agency, Frank-Jürgen Weise, who now holds both positions. This reflects the present political rhetoric to treat the influx of Syrians as an economic potential, as Weise’s speciality is streamlining the speedy integration of job seekers into the labour market and cutting costs for the welfare state. The intention of Weise’s appointment seems to be to realise the economic potential offered by highly-skilled Syrians to the aging German workforce. The Employment Agency is known to those who have had to subject themselves to its procedures to obtain the meagre “Hartz IV” unemployment benefits essentially as an inhumane apparatus of bureaucracy. Weise’s appointment to the Office for Migration and Refugees runs the danger of inserting a neo-liberal way of doing business to the task of processing asylum applications which follows an inherently different logic. Keeping in mind the changes to the asylum law, refugee policy in Germany at its core seems to aim at capitalising the human resources of highly-skilled refugees while pushing out the undesired “economic migrants”. This leaves little room for the exploration of socio-cultural enrichment for the mutual benefit of both the refugee population and the German society. The lesson Germany can learn from Uganda is that generosity in the face of inevitable change pays off. The revised asylum law reflects the deep-seated fear of changes to the status quo, which is also expressed by many politicians who say Germany has to set an upper limit to the number of grants of asylum because the capacities to receive refugees are limited. However, compared to the entirety of the African continent, Syria or even Greece, capacities are not limited. What is limited is the willingness of the population and its elites to accept the impending changes to their lifestyle and the loss of a comfortable distance from global challenges. 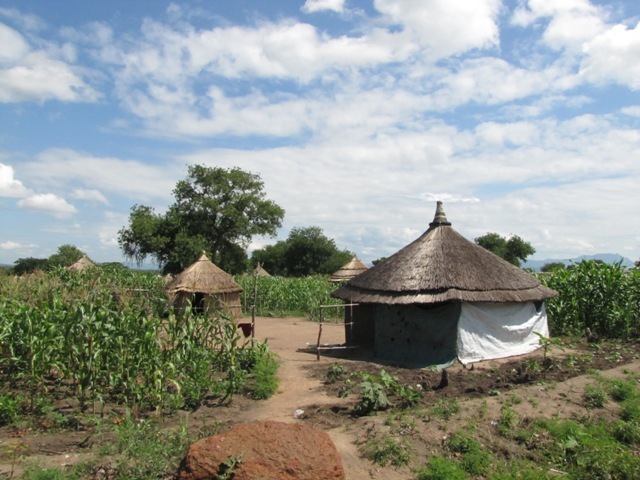 Granted, people in northern Uganda might initially have an easier time accepting South Sudanese into their communities because the colonial border separating them does not reflect a big cultural divide and because most of them are almost as poor as the new arrivals. But the millions of people crossing Turkey, the Balkans and the Alps, parts of the way on foot (and the intervening water body on flimsy boats) represent a force of change that simply cannot be ignored. To find durable solutions for refugees, Germany needs to embrace change. A policy for regional development that encourages refugees to become part of local economies and invests in social services for both nationals and refugees will make way for a social and cultural exchange with the hosting communities. In addition to cutting refugees’ economic integration short by granting the unconditional right to work and access to education, this requires a change in attitudes and the realisation that “quality of life” is more than what can be expressed in the monthly rate of unemployment benefits or refugee support. 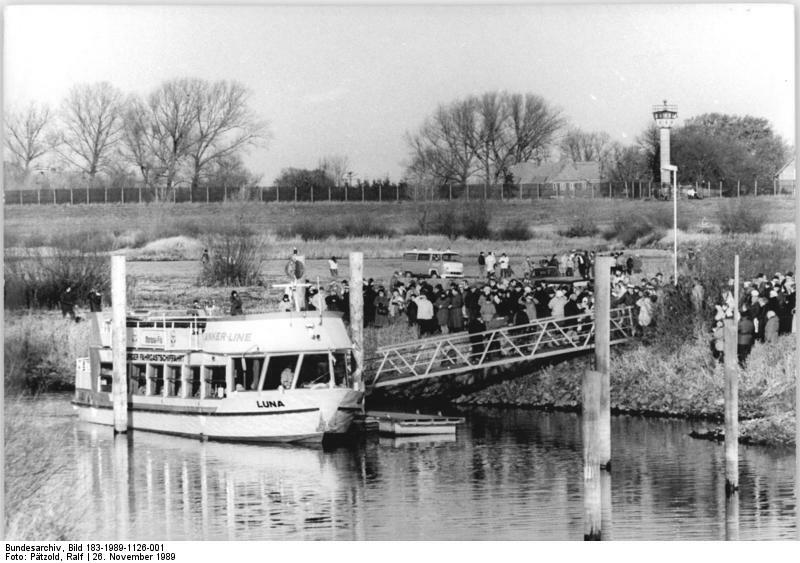 First crossing of the former inner-German border, river Elbe, close to Sumte, after the fall of the Iron Curtain. Photo credit: Wikipedia. What does this mean for the indomitable citizens of Sumte? Even though it might be scary, they could become pioneers who break down the borders between “us and them” by inviting in refugees. After all, they have a historical precedent in their community: Sumte is a former frontier town on the eastern side of the iron curtain. After the reunification of Germany in 1990, Sumte was part of the only municipality that “changed states” and became part of the territory of the western federal state of Lower Saxony – in a way, all citizens of Sumte are international migrants. A Concept Paper for the Settlement Transformation Project, Office of the Prime Minister, Republic of Uganda, April 2015, unpublished. Durable Solutions Framework, UNHCR 2003, p 25.